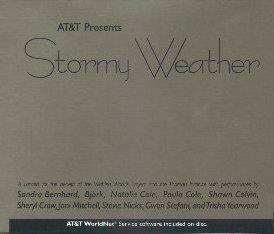 concert were released on a promotional CD by AT&T. Just returned from an incredible evening at the Stormy Weather benefit for the Walden Woods - Thoreau Foundation headed up by Don Henley. It was very wonderful and music director Larry Klein did a brilliant job. Met up with Ken C. and Steve J. for pre and post drinks and we rubbed elbows with the likes of Mick Fleetwood, Ted Danson, Mary Steenburgen, Pat Sajak(! ), and Penny Marshall along with the assorted record industry big guys and smattering of soap opera actors. (I actually had better seats than Mick and Lindsay Buckingham who sat two rows behind me! They are both 12 feet tall and Mick looks quite fantastic). Ed Begley, Jr. was the emcee. The overall impression I had of the concert was that these women really were able to showcase their voices in the 1940s music they sang. 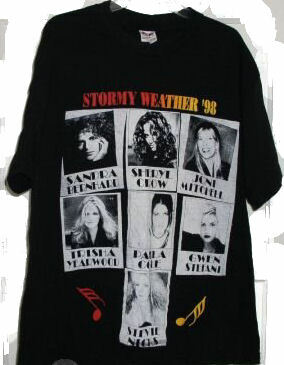 I came away with a lot more respect for many of them, especially Gwen Stefani and Paula Cole. Cole was mindblowing. Shawn Colvin, Trisha Yearwood and Sheryl Crow were all fantastic. Natalie Cole made it all look totally effortless and really stood out as the pro. Sandra Bernhardt, who actually has a very good voice, was brilliantly hilarious in her version of "Is That All There Is" and a high falsetto, operatic version of "Summertime". Bjork was very unique and sang the songs with a pronounced accent - very Euro. 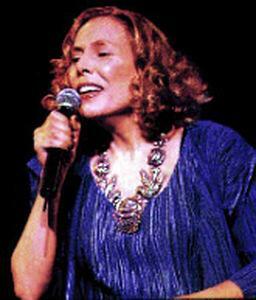 She sang "Gloomy Sunday" and some of the lines came out "I vas onlynk dweemink" and "Gloomyk Sundayk" and then...she announced that the organizers were so very nice and wonderful to her for letting her introduce the"most gorgeous-ess woman in the world - Joni Mitchell." Joni came out and sang a duet with Bjork - "What Is This Thing Called Love." 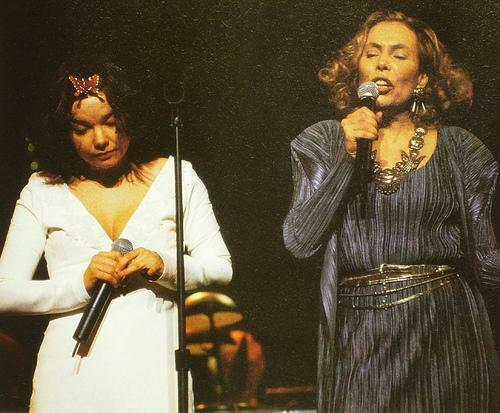 After the song Bjork threw her arms around Joni and gave her a big kiss. Joni went on to sing "Stormy Weather" and the wonderful Marvin Gaye song "I Come Apart" (I can see her and Van doing this one as a duet). Joni seemed a bit shy at first but finished strong. At the end all of the women came out on stage holding hands, with Joni leading the pack. When she saw Klein on stage, she grabbed ahold of him and hung on tight. It was clear to see they still have a very strong and affectionate attachment and he just seems like the nicest guy in the world the more I see of him. Oh, I just remembered I forgot to mention Stevie Nicks - she sounded better doing the old forties songs than I've ever heard her. She had lots of Stevie-heads in the audience and they yelled and cheered and gave her a standing ovation. I was glad that I also heard many cheers and yells during Joni's segment. Joni and Stevie were the biggest hits, I'd say. I also think that Klein did one hell of a job. And the El Nino orchestra had to have the best musicians in town - absolutely outstanding. And now I will let Ken tell you more as I pack for Pittsburgh! What a fun, classy, FABULOUS appetizer to the upcoming concerts! A full orchestra and conductor, each bandmember sitting behind a little box with an "ENO" logo painted on it. Think here of any number of thirties and/or fourties movies and lots of Streamline Modern. By now you will have read Kakki's take on the concert and maybe the impressions of a couple of others. 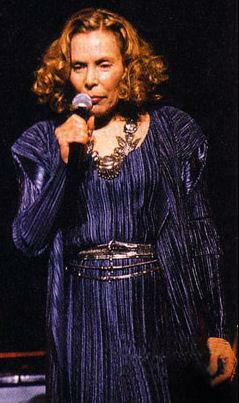 Here are some of my highlightes: Even though she was on last, I'll start with Joni first. 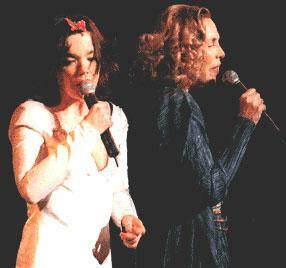 A duet with Bjork, imagine that. Great image of them up onstage! A real contrast, the small, gushing junior memmber who got to introduce her and the cool grand dame trading phrases back and forth. This was a moment and Joni got one of two MONSTER receptions from the crowd(the other being for Stevie Nicks.) There were many many people there to see her. The guy next to me said to his girl friend, "where has she been lately?" Joni was right in the KCRW interview, "for the most part people of my generation don't know I'm still in the business." There were no other pairings like the Bjork-Mitchell number, which was a shame but I suppose it would have been a different kind of evening if there had been. As it was, singers were on for two songs then off, very democratic. 1.) My partner Steve and I walking into the lobby of the Wiltern Theatre and spotting Kakki in this exotic coat made of black printed Chinese silk. 2.) A pregnant and slightly weary Shawn Colvin singing "One For my Baby...."
Why doesn't she just end it all.. If that's all there is my friend..."
4.) Stevie Nicks WITHOUT her trademark black flowing dress and platform boots(in keeping with the evening's theme it was a floor length melon-colored number.) 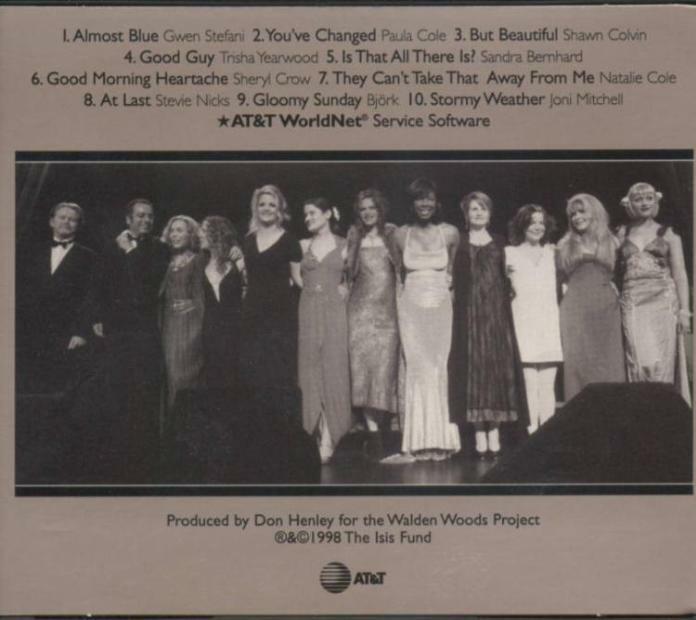 Unfortunately she had some vocal problems on the first number "When Sunny gets blue". The second number "At Last" was a big improvement. 4.) Bjork in the "most inspired choice of material" catagory did "Gloomy Sunday." The people sitting in my section (way in the back) didn't get Bjork at all. They were mostly there for Stevie Nicks and in fact, several left after Stevie's performance. There were other memorable moments but I've gotta stop somewhere. My vote for worst part of the evening goes to MC Ed Bagley Jr.(sp?) for his repeated and witless jokes about George Michael. P.S. After the show Kakki, Steve J. and I repaired to the Atlas Bar & Grill next door to compare notes. A story in itself. We hung around and talked for a long time. On the drive home Steve and I popped the soundtrack to L.A. Confidential into the tape player and as it happened, got behind the utility truck hauling all the little "ENO" bandstand boxes back to some warehouse in SouthGate for storage...a funny way to end a glamorous evening! 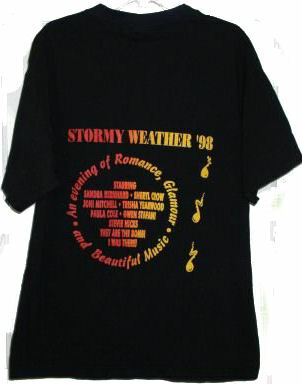 jm chose a modified ATHENA look for the elegant Stormy Weather 98 evening. she boogied out to Bjork's hyperbolic introduction in a steel-blue on steel-blue stripe knee-length straight line metallic number with a matching square, hem-length scarf hangin' down the back. At her waist was one of her trademark ArtNouveau/AmericanIndian silver belt pieces, wildly filligreed, about six inches wide, cinched in the back (under the scarf). she had the same thing going on in a necklace, very large (2-3 inches wide), heavy and kinetic. her shoes were the minimalist-est of high heeled sandals, brown 1/4 inch straps, methinks. and her HAIR (you breathlessly ask) was no longer than chin length and industrially curled (or permed?) into a retro-thirties very loose blond flip. ...I'm tardy in getting this correction to the list but Steve wants me to let you all know, he is aware that he was off on the length. Rather than being knee-length, the gown was somewhere between the ankle and several inches below the knee. She had some layering going on. It was an ensemble. There was the main dress, a long sleeved jacket/scarf thing over that and a long black skirt underneath everything which hung down to her ankles. P.S. I wouldn't even try to compete with Steve in the descriptive writing category!